The small intestine is a hotbed of microbial activity and a target of probiotic treatments for diarrhea, inflammatory bowel disease and irritable bowel syndrome, among other conditions. To make it to the intestine, though, probiotics must first pass through the stomach, a hostile acidic environment that can kill these beneficial bacteria. Now, scientists report in ACS Sustainable Chemistry & Engineering the development of a protective gel sphere that may offer probiotics a safer route. Probiotics are living organisms and have beneficial effects when they colonize the body, assuming they can stay alive long enough to do so. Probiotic treatments are packed with bacteria, but once swallowed, their numbers are dramatically diminished by the stomach's acidity, lowering the chances of therapeutic effect. In previous work, scientists have attempted to protect probiotics in the stomach by encapsulating them in alginate, a gummy polymer produced by algae, like fruit trapped in a gelatin mold. Alginate isn't the ideal treatment ingredient though, because it can breakdown easily. 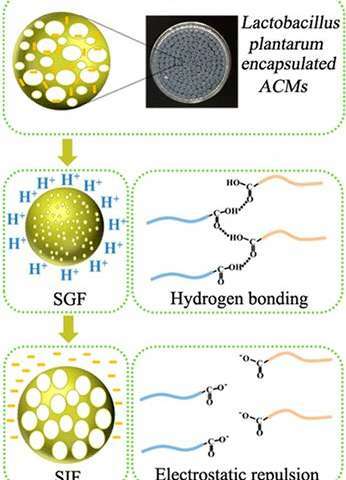 To beef up the stability of alginate, Hu Tang, Fenghong Huang and colleagues wanted to see whether adding cellulose, a fibrous biocompatible polymer with excellent stability, could help. To make the probiotic shield, the researchers mixed dilute solutions of cellulose and alginate, then added the "friendly" bacteria to that mixture. The final step was to drip this brew into a solution of calcium chloride. The researchers dropped the probiotic globs into an acidic stomach-like environment and found that the gel held onto the bacteria. By contrast, in a simulated intestine, which has a more neutral pH, the bacteria gel swelled, releasing the probiotics. They say that the next step is to test the encapsulation system in animals.